For all my friends, I am glad to let you know that we are releasing the smallest tube amplifier in the world — APPJ-6F3. 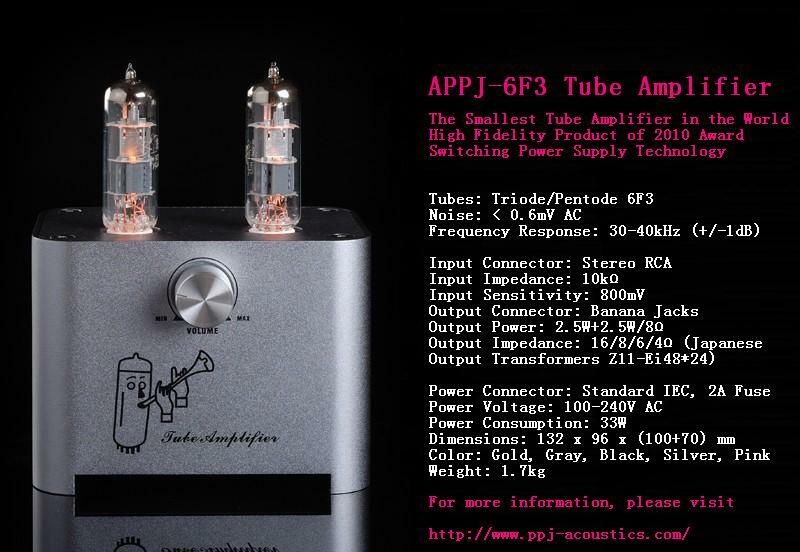 In short, APPJ-6F3 is a small stereo tube amplifier, working in Single-Ended Triode (SET) mode. Tiny as it is, its performance is comparable to a full size high level amplifier. This is a gadget built for audio professionals, musicians, and hobbyists. Still wondering whether such a small device could produce HIFI audio? APPJ-6F3 won the Product of the Year 2010 Award in the category of integrated amplifiers by High Fidelity Magazine. This is not a joke. For more information, please visit the official PPJ Acoustics Studio website.